Outta the strait and into the sound. We are shooting for Miles Inlet on the mainland side of Queen Charlotte Strait. Our internet will disappear soon so this will be the last post for awhile. The weather is so-so, warm but not sunny. We are hoping to get some really nice weather by next weekend when J & J visit us on our boat. Keeping our fingers crossed. See you soon Mom and J & J!! Looking west along Chancellor Channel. We are motoring west up Jonhstone Strait looking for some wind today. The forecast was for a nice 10-15 knot SE wind which would be perfect but so far it is calm as can be. Our destination will most likely be Port McNeill, but we might not stop there, maybe just keep going depending on our wind. This is my attempt to grow some lettuce on this trip, so far they are looking pretty sad. We are on our way again, up past Desolation Sound and through the rapids for the slack at 1:00p. Not sure just yet where we will end up tonight, probably one of our favorite spots... Helmken Island in Johnstone Strait. We are in Bessbourough Bay, it is flat calm which is so nice after rocking and rolling all night in our anchorage near Jedidiah, usually a nice spot. Looking forward to a nice deep sleep. Tomorrow we will head to Port McNeill. The crew were in better spirits after we got anchored and then onto solid land. We went ashore on Jedidiah to see the wild sheep and were not disappointed, we found quite a few, but they promptly ran off when they saw us. Aiden found an eagle feather and then I found another two. We also found a pile of sheep bones and a skull from a wood pecker (I think). Very exciting day! We are on our way to Comox Harbour to drop the kids off, then we will try to make it across to the Savory Island for the night. We might have a few days coming up with no internet, probably not until Port McNeill. NW Winds 10 -15 knots this morning, made for a bumpy ride. Two of our crew were sick, the third has a stomach of steel. All three got fell asleep for awhile, so things were very quiet around here for a good hour or so. We are going to go ashore on Jedidiah to see if we can find the wild sheep while we burn off some extra energy. Eagle sitting in our tree after the rain stopped. The last bit of packing is happening this morning, loading up the fridge and freezer. We are leaving about 12:30 to catch the slack in Dodds Narrows. 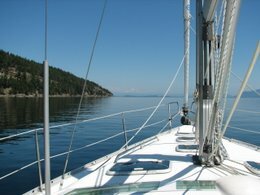 The weather is co-operating, looks like we will have a nice sail tomorrow as we leave Nanaimo and head over to Lasquiti. We'll be on the water tomorrow! Just having some fun with the camera... but seriously, this is a picture of our stern... we now have our home port on our boat. Finally after all these years, we decided it would be a good idea to have where we hail from. This nice looking decal was professionally made for us by wallSAYtional Vinyl Art and Decals . Jerry is getting the kayaks on board, making sure they are strapped on good and tight. Most definitely one of our very favorite things to do when we are "out there" is to kayak around all the little nooks and crannies, very quietly, and it is amazing what we get to see. Haida Gwaii here we come! we have installed a new Dickinson propane heater! Yay!! Finally we will have all the heat we need to stay toasty warm. Above you can see the chimney cap next to the mast. Our aim this summer (if it ever arrives) is to sail up the west coast to Haida Gwaii (formerly Queen Charlotte Islands) and spend a month there and then plan to be back home beginning of September or so. I have packed enough provisions to last us about 70 days more or less. We are going to be trying some different tastes this summer... sea cucumber, sautéed bull kelp, and maybe some Dead Man's Fingers if we can find some nice fresh ones. Where we beheading there should be lots. We are looking forward to meeting up with family out of Bella Colla and having our cousins on the boat for a few nights. Keep posted, we will try to post everyday if possible when we are within internet range.